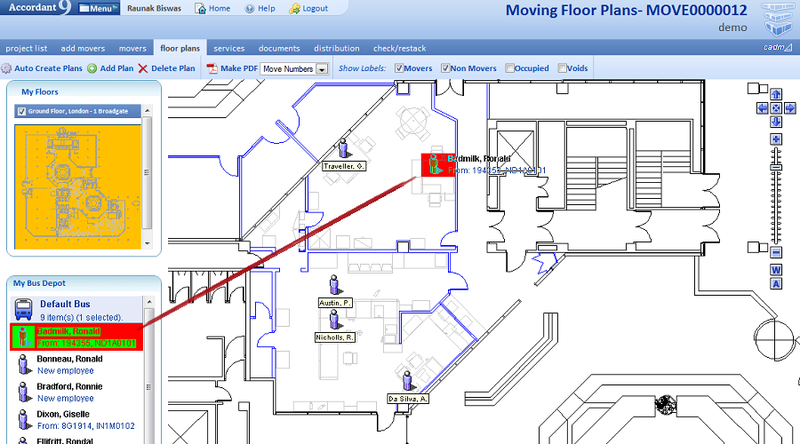 By default when you first access the floor plans tab for a particular Move Manager Project no plans are loaded. 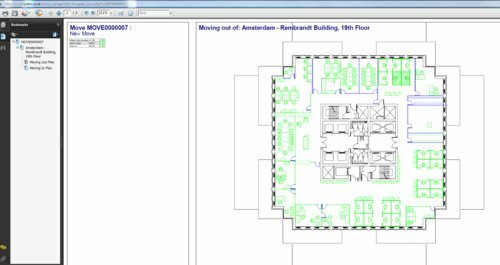 If there are already movers in the job you can automatically create and add floor plans with AoIs (Area of Interest) around them by clicking Auto Create Plans. 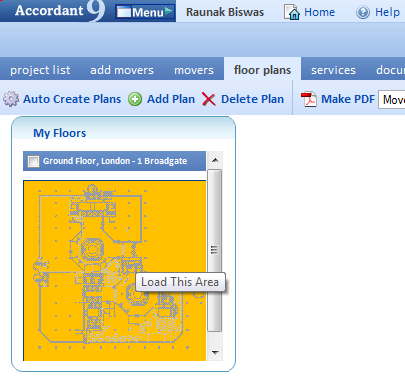 By clicking Auto Create Plans, Accordant will automatically populate the page with the floor plans where the movers are currently sitting. 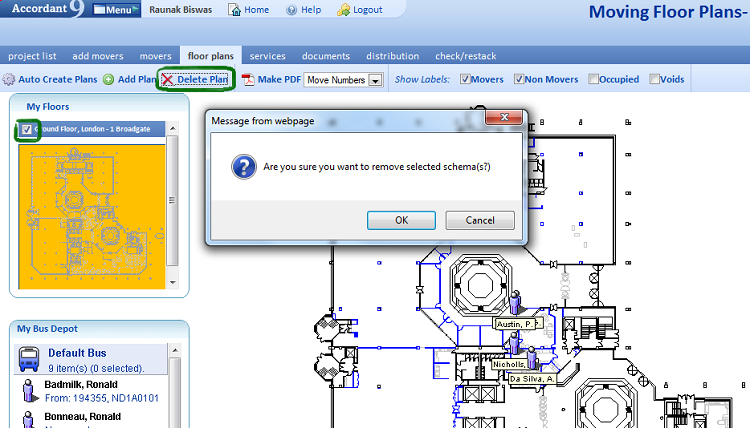 Alternatively, you can add plans by clicking Add Plan. When you click add plan, it launches the Find Floor window. You can choose to look for floors In Job, or by unticking this box, all floors. 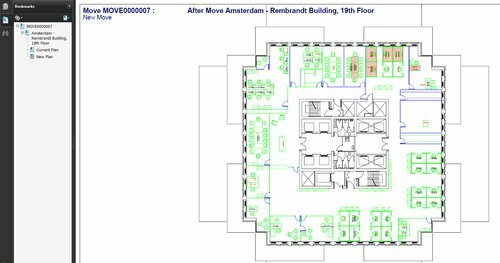 When you have selected the floor that you require from the list, click Use This to add the corresponding floor plan to the current move project. Added floor plans appear as thumbnails under My Floors. Each floor plan shows a shaded AoI. By default, this is the entire floor area. To remove floors that are not required select the tick box next to the floor name under My Floors and click Delete. To change the AoI of a floor, click on the floor description under My Floors. This launches the Edit Area of Interest Window. The AoI can then be selected and resized or dragged like a normal window. Once the required AoI is selected, click on the Save Users to Project button. When an AoI is clicked in the thumbnails under My Floors the floor plan loads showing the selected area in detail. To select an employee to be relocated, click and hold the left mouse button, and drag the employee from their current desk or from the Default Bus. 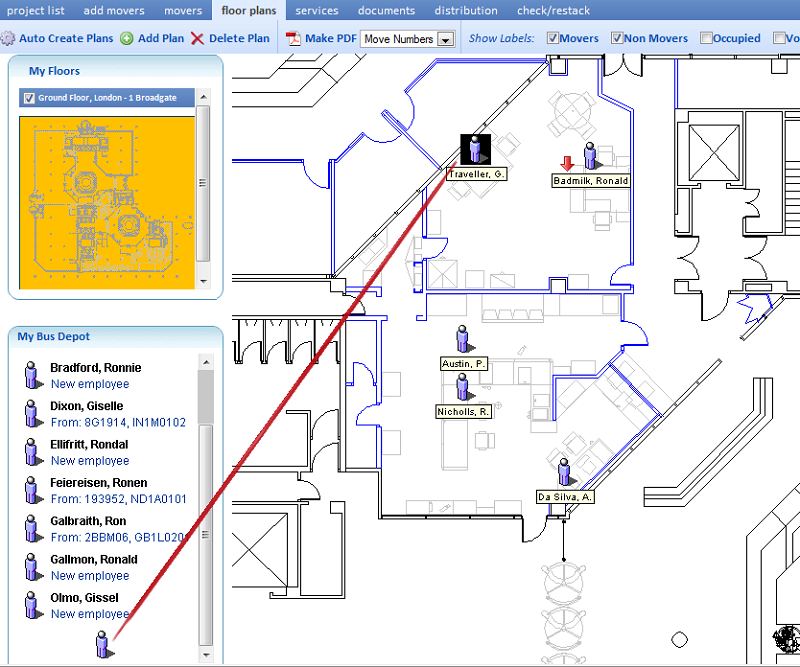 Whilst continuing to hold the left mouse button, the employee can be dragged to either another desk location on the same floor or the default bus (required if locating to another floor/building). Release the left mouse button over the required location. If an employee is moving to the default bus then the icon must be dropped on to the bus icon. Dark green desk locations show seatable locations that already have an employee sitting there. Light green desk locations show vacant desks. Grey locations show non-seatable locations. Once an employee is removed from their location, their employee icon and name plate will still remain. However a green arrow pointing up will be displayed to indicate that they have been set to move out. 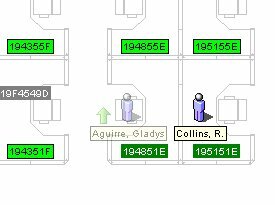 If the employee has been moved to a new desk then their icon and name plate will show on the new location as well as a red arrow pointing down to indicate them arriving at their new desk. Note: An employee that has been set to move has not been moved in the database until the Move job has been restacked. The employee has been added to the movers table. If a further change is required, then the employee can be dragged back to their original location, or they can be deleted from the movers tab. If employees are to be re-located to another floor then they will be held on the default bus. The floor plan that has the new location should be brought in to view by selecting it from My Floors. The employee can then be dragged from the bus to their new location. In the Movers tab any movers that have been relocated through floor plans will be added and updated in this view automatically. Note 'Traveller G' has been added to the 'movers' list and his 'To' and 'From' Locations updated accordingly. In the Floor Plans tab you can create PDFs of the currently viewed floor plan by clicking Make PDF. 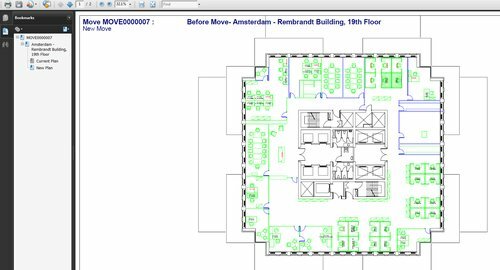 The Move Numbers PDF lists all mover on the current floor and highlights the relevant locations with the corresponding numbers.